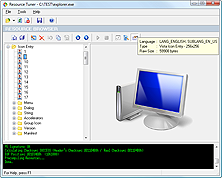 Resource Tuner Feature Tour Resource Viewer and Extractor Resource Editor. Resource Tuner is packed with features which make it an essential tool for anyone tweaking another programs. This Feature Tour covers some of the most popular features of Resource Tuner. Find out how Resource Tuner can help you have a personal touch on your favorite applications.